dish, it’s packed full of flavor. This Whole30 dinner recipe is crazy easy and fast, too. Cauliflower grits make this dish low carb, keto, and paleo! I threw together this recipe during our first Whole30, when I had bags of frozen shrimp on hand and no clue what to do with them. I was tired of zoodles, so shrimp scampi = nope. Tired of cashew-cream-fortified chowders, so potato and shrimp chowder = no sir. Really, really tired of coconut milk curries, so basically every Whole30 shrimp recipe on Pinterest ever = naw naw naw. Instead, I just absolutely smothered my shrimp in Cajun seasoning and threw them in some hot ghee in a cast-iron skillet for a few minutes. Steamed a bag of frozen cauliflower with a minced clove of garlic, then blitzed it with a little more ghee in the food processor until smooth. Um… OK, you’re done? Told you… the perfect paleo shrimp and grits recipe. Five ingredients, fifteen minutes. I cannot overemphasize how easy and quick and freaking delicious this recipe is. I don’t even know how to use the English language emphatically enough in this case, so even italics are necessary. Maybe even some excess punctuation!?!? It’s really that easy, quick, and freaking delicious, y’all. They’re oh so simple, with only five ingredients! 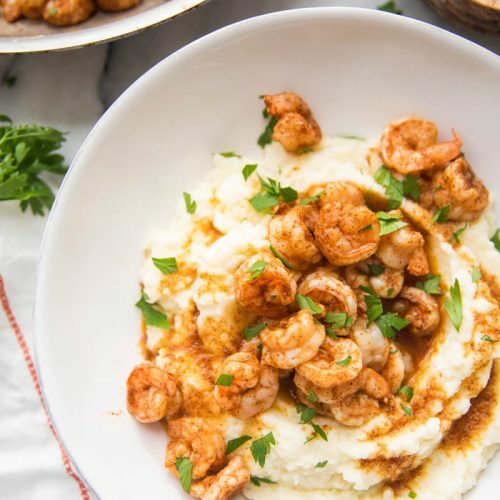 These healthy shrimp and grits focus on flavor, with plenty of Cajun seasoning, making the dish delish and super easy. Cauliflower takes the place of traditional grits, so they’re Whole30, paleo, keto, low carb, and grain free. The entire dish can be made in about 15 minutes. The shrimp are coated with Cajun seasoning and cooked in ghee, and this becomes the luxe sauce. It couldn’t be easier or more flavorful. 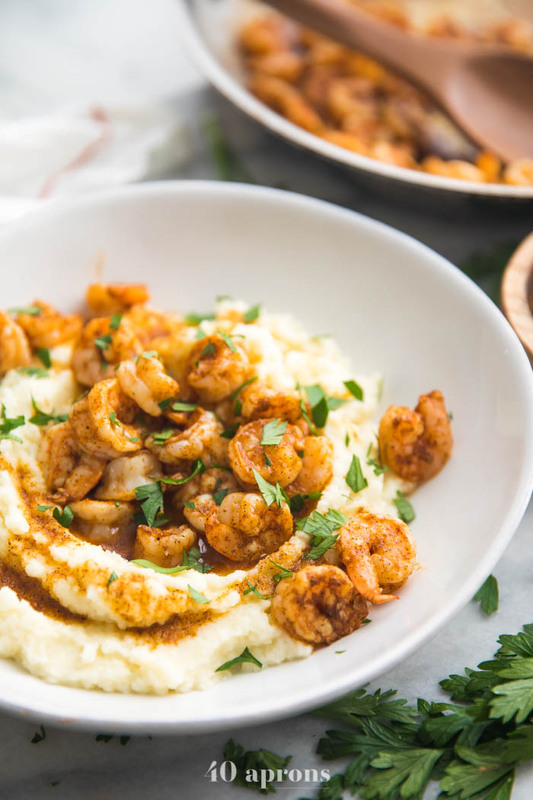 This paleo shrimp and grits recipe is elegant enough for company but quick and easy enough for any weeknight. If you’re not on a Whole30, you can use butter in the cauliflower grits. So good. Try scallops in place of the shrimp for an elegant but easy main course. Serve with garlicky kale: Mince a bit more garlic and sauté it in ghee or butter (if you’re not on a Whole30) until fragrant. Add several handfuls of kale and cook, stirring regularly, until bright green and softened. This side dish is lovely with the Whole30 healthy shrimp and grits and fits right into your super-quick timeline. If you’re not grain free, Whole30, keto, etc., you can absolutely substitute traditional grits for the cauliflower grits. Cook the shrimp only until they’re just cooked. They will turn pink and will no longer be translucent: this is your cue. If you keep cooking them past this point, they’ll go from tender and juicy to tough and chewy. Make your own Cajun seasoning! This recipe is delicious and it’s Whole30, too. If you don’t make your own Cajun seasoning, be very, very careful not to use one with salt already in it. 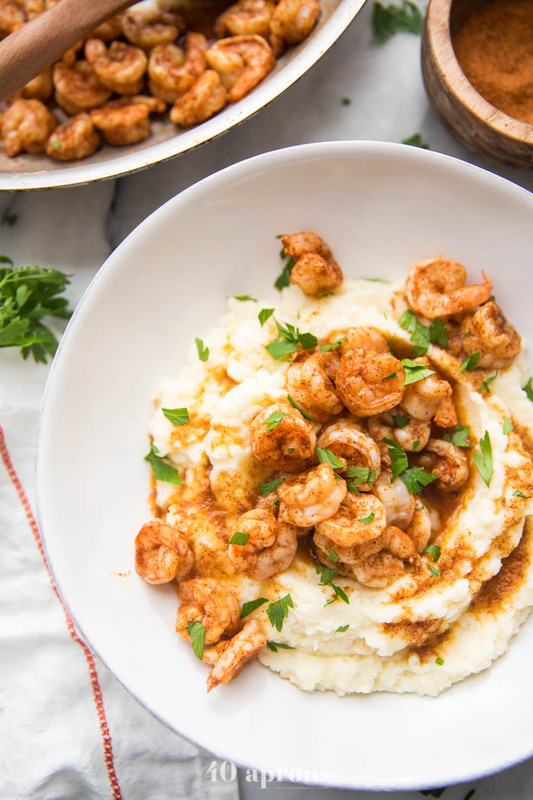 You’ll have way oversalted healthy shrimp and grits if you do! Oh, and these cauliflower grits aren’t going to taste just like traditional grits. I’m from the South and know what real grits taste like, I promise! But I also promise you’re going to love love love them when you’re on a Whole30, or if you’re keto or paleo. Steam your cauliflower with garlic until tender. Transfer to a food processor and add ghee. Process until mostly smooth but not puréed – you want a little texture left to emulate grits. Season your shrimp very, very generously with Cajun seasoning on both sides. Heat ghee in a large skillet, preferably cast iron, until hot. Add shrimp and cook a minute or two, or until pink on the bottom side. Flip and cook another minute or two or until shrimp and all pink and no longer translucent. Do not overcook. Spoon “grits” into serving bowls and top with shrimp and lots of the ghee sauce leftover in the skillet. 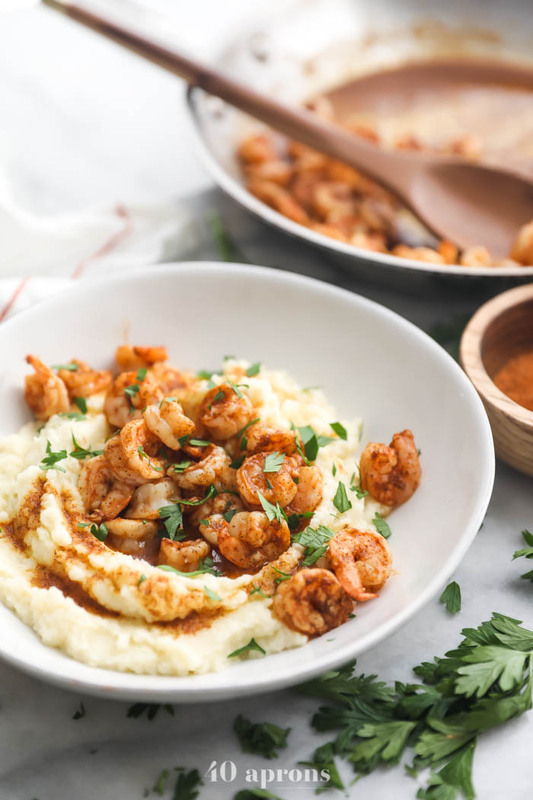 Tada – Whole30 healthy shrimp and grits in 15 minutes! 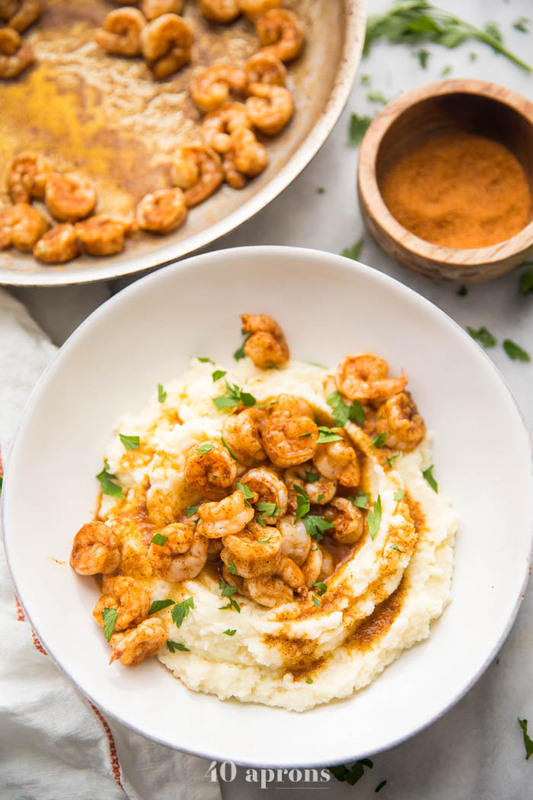 Spicy, tender shrimp in a rich, simple sauce over garlicky, creamy cauliflower "grits." What could be better? Whole30, keto, low carb, paleo. Fill a medium saucepan with a couple inches of water and bring to a boil. Place frozen cauliflower in a steamer basket and top with 1 large clove garlic, chopped. Cover and steam until tender. When tender, place steamed cauliflower and garlic in the bowl of a food processor and add ghee or butter. Do not get rid of steaming water! Blitz until almost the desired texture. Add salt and a bit of steaming water, if desired, and process again until the desired consistency. Meanwhile, make your shrimp. Pat dry and sprinkle very liberally with Cajun seasoning. You want the shrimp to be almost entirely coated, so don't skimp out here! We probably use about 2-3 tablespoons of seasoning. If your Cajun seasoning does not include salt, salt the shrimp now as well. Heat 2 tablespoons ghee or butter in a large skillet, preferably cast-iron, over medium-high heat. Once the skillet is very hot, add the shrimp and cook about a minute or two, or until the bottom side begins turning pink. Flip the shrimp and cook until the bottom side is turning pink. 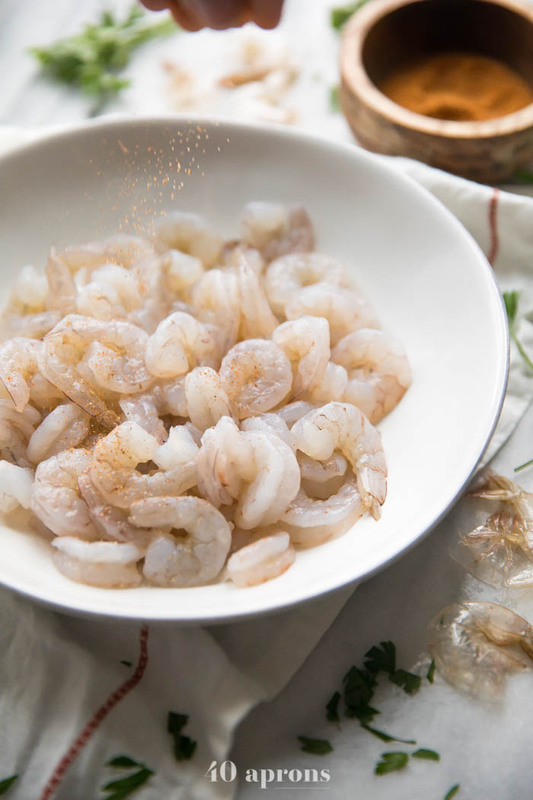 When the shrimp are no longer translucent down the middle, where they've been deveined, remove from the skillet immediately. Spoon the cauliflower "grits" into serving bowls and top with half the shrimp. Pour the ghee and Cajun seasoning "sauce" from the cast-iron skillet over serving bowls. Serve immediately. *I make this Cajun seasoning recipe at home.